"Yarns for EWE and ME"
The Covered Bridge has been around for about 40 plus years. When first started, it consisted of a craft shop, then a yarn shop was created on the top floor of the old chicken coop. It was a very popular spot to get your crafting, painting, stenciling, quilting supplies and anything else you could imagine for whatever you wanted to create. There were 3 floors of all kinds of crafting ideas for any craft you had in mind. At the time, this was the only place people could find what they were looking for. All kinds of classes were held at the store, from embroidery, needlepoint, stitchery, knitting, tole painting to quilting. There were no other stores offering so much in one place that carried the variety that Covered Bridge carried. As time went by, new stores popped up and suddenly people had other choices. The old store had a lot of competition, so unfortunately it closed, except for the yarn shop. 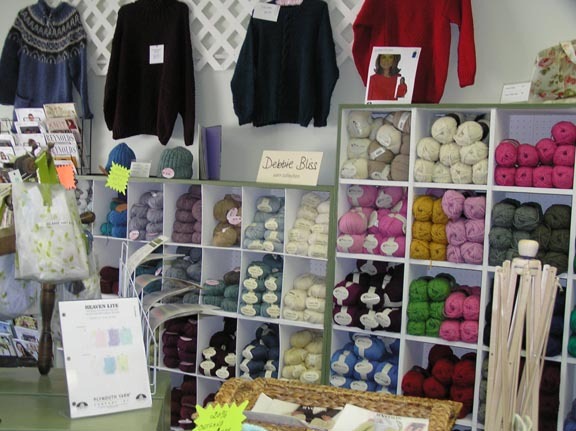 It was decided that there was a need in the community for a yarn shop because so many had closed their doors. The yarn store was moved to the Amherst Plaza, Amherst, N.H. back in 2000. It was sold in 2003. It continued to carry quality yarns and other products and also giving personal service. In 2008, the plaza burned and Covered Bridge suffered smoke and water damage, losing all contents. There were two choices, either to close or re-locate to another home. The decision was made and we re-opened in October, 2008. We still give personal service, and offer many choices of great quality yarns. NORO: Silk Garden, Kureyon, Kochoran, Iro, Chiremen, Taiyo, Silk Garden and Kureyon sock yarn. PLYMOUTH: Encore worsted, chunky, dk. Too many others to list. Stop by for a visit and look at all the beautiful selections for your next project. Looking at samples made from current books and patterns and using new yarns for many of the projects. Or just stop by and get inspired. Peruse the books at your leisure and enjoy! Click HERE for a tour of our store.